This elegant Riedel Eve decanter is an artful masterpiece, as well as an extremely functional wine vessel. 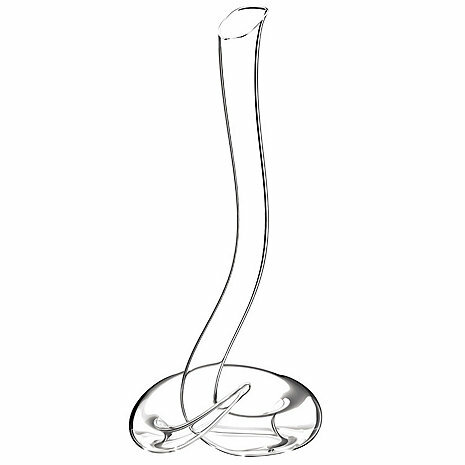 The Eve decanter features a generously tall silhouette of almost 20 inches, and the unique design is reminscent of an elegant upright cobra waiting to drink the wine you pour forth. This elegant Riedel Eve decanter is an artful masterpiece, as well as an extremely functional wine vessel. The Eve decanter features a generously tall silhouette of almost 20 inches, and the unique design is reminscent of an elegant upright cobra waiting to drink the wine you pour forth. The person serving from this decanter can create a dramatic presentation, as it is necessary to turn the vessel a specific way to pour. No worries, though. Beautifully packaged in Riedel's signature black and red box, the EVE decanter comes with an instructional DVD narrated by Maximilian Riedel, which explains the pouring technique and cleaning instructions. Delight your guests and serve them a lovely red wine in this visual masterpiece. Mouth-blown. Recommended to hand wash. The sensuous, serpentine curves of Riedel's new crystal, mouth-blown Eve decanter are not only seductive, but functional. This design tour de force double decants your wine as it flows through the coiled shape. Serving wine becomes a performance as the decanter's twist and turns require the same movement by you - turning the decanter in a slow 360 degree rotation to 'charge' the decanter and allow the wine to pour. EVE is a decanter that also speaks - it emits a sound akin to the gurgle of the King Cobra as the wine makes its trip through the curvaceous swirl of glass. Eve's long graceful neck means that you can easily pour a guest across the table without moving from your spot. The Eve decanter, designed by Maximilian Riedel in 2008, is a tribute to the family's matriarch, Eva Riedel. Each Eve decanter is free blown by a master glass blower in Austria and is a unique and functional work of art. What is the best product to use to clean this decanter? this is definitely the star of every dinner party we have. the only problem i have with this beautiful decanter is drying it after each use. it takes a long time to dry since water gets trapped in the curves. i actually put it in the shower and wash it!! needs extra care but worth it! we entertain very often and use our decanter. it's a true conversation piece. very elegant and not difficult to use. the only extra attention that it needs is when i wash it. it tends to trap water in its curves. so it takes a while for the decanter to dry. and one has to turn it frequently to empty the trapped water. but it's all worth the trouble. The family loves the design and unique use of this decanter. very beautiful decanter, perfect gift for my boyfriend for his wine cellar. Eve is expensive but if you are looking for something very special it is well worth the price. Unique, decanters exceptionally well, looks great on the table and our guests love it. What more is there to like.